As we prepare for the 2018 legislative session, I know that the folks at Iowa Gun Owners are already hard at work preparing for an all-out push on Constitutional Carry legislation. Having been in the Senate for seven years now, I can tell you that I’ve never seen a grassroots organization with more effective members than Iowa Gun Owners. Numerous gun control bills blocked. Their legendary program in the election season last year which exposed anti-gun Senators that lead to the flip of the Iowa Senate in 2016. Passage of Stand-Your-Ground law this year, and more! Of course, being a supporter of Iowa Gun Owners you already know all of this as you’ve been a part of it! But as Iowa Gun Owners gears up to push Constitutional Carry in the legislature next session — they need more grassroots activists who are able to fight alongside of them using effective tools that work! That’s why I’d like to invite you to attend the 1-day Political Leadership School that Iowa Gun Owners is hosting in West Des Moines next month! This school, being held in conjunction with the Foundation for Applied Conservative Leadership, will give you the tools you need to get directly involved in the fight for the Second Amendment. >>> The proper use of social media for non-profits and political organizations. Of course, I’m only scratching the surface of this class as it’s jam packed with information that you can put to use right away! LOCATION: Raccoon River Nature Lodge, 2500 Grand Ave, West Moines. COST: $50 for regular admission, which includes lunch, but if you sign up before October 28 you’ll qualify for the ‘early bird’ rate of just $40. WHAT TO BRING: A laptop or note pad for taking notes. This class is filling up quickly, and space is limited for this event, so please register to attend right away by clicking on the box below! With the 2018 legislative session start date just two months away, now is the perfect time for you to attend this class! Our gun rights are only safe as long as there are trained activists who are willing to defend them. So please, if you haven’t already done so, make plans to attend this training today! P.S. 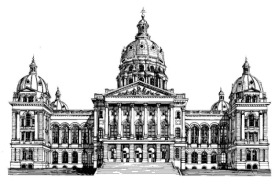 With the 2018 legislative session only a few months away, Iowa Gun Owners is already preparing a major grassroots push to enact Constitutional Carry as they build off the success they had in 2017!To do that, they are putting together a 1-day Political Leadership School in West Des Moines for serious activists who want to take their involvement to the next level. The training will take place Saturday, November 11, from 9:00am – 5:30pm in West Des Moines — and I really hope that you can attend! This class is being hosted in conjunction with the Foundation for Applied Conservative Leadership and if you register before October 28 you’ll quality for the ‘early bird’ pricing. Our gun rights depend on citizens like you and me who never tire in effectively fighting for them, and this school will teach you exactly how to do that! So register today! Not produced or sent at taxpayer expense.